Because in recent days you can see that something is happening on the Hedgewars Forum that should never happen. 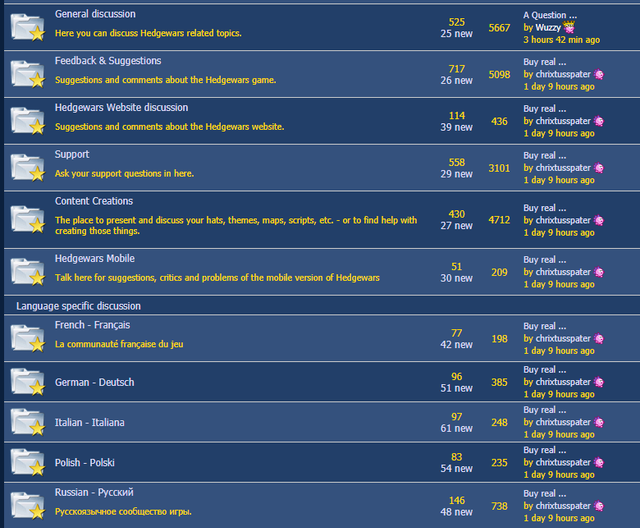 I will go straight to the point: is it possible to add protection of the Forum to something like this for the future? (CAPTCHA before publishing the topic or break between publications)? You already need a registered account (thus captcha) plus email confirmation to post. So that's already in place. We used to have a lot more spam before we made the captcha more aggressive. These days it's just a few a month and they are killed as soon as an admin notices. It just so happened I was pretty busy this weekend, and no one else apparently bothered to block and kill the user. https://www.hedgewars.org/node/5247 There's a history of how bad it got here. Such behaviors should be easy to detect, so maybe these spammers could be banned and cleaned automatically? To notify dev channel. I guess it could use some rules to unpublish. I'd not want to do deletion without human review though. http://hedgewars.org/node/3377 According to the stats we're at 7 cleanups in last 30 days, which is a little high. If someone posts the same topic all over the forum, it doesn't matter if it's spambot or regular user, does it? It's obviously unwanted behavior, so that case could be handled automatically. Or any case when someone posts literally the same thing 3 or more times.